HPANWO: "Stop Immigration- World Government NOW!" It took a lot of courage for this man to speak what he had to say for the world to hear. The retribution could be phenomenal, but at least he was willing to take a stand on his and Austrillia’s (sic) beliefs. (Maybe if we circulate this amongst ourselves, WE will find the courage to start speaking and voicing the same truths. http://hpanwo-voice.blogspot.com/2009/10/bnps-nick-griffin-to-speak-on-bbc.html . As you can see in the linked articles, I’ve long suspected that the immigration issue is a Divide-and-Rule/ Problem-Reaction-Solution ploy. Mass immigration can and does indeed cause social problems. But there is no frying pan in this world that is so bad that it justifies us jumping into a fire to escape from it. We must be very careful. When the media promote something that makes us angry, whether that anger is justified or not, it is usually designed to wind us up to the point when we will support anyone and anything that comes onto the scene to offer us a solution. The solution to the immigration problem may well be more extreme laws and enforcements; and can't we just see it in the bit where Kevin Rudd approves of Big Brother snoopers spying on Mosques! Paradoxically this can mean an even faster and further breakdown of national sovereignty because the ultimate anti-immigration measures will need to be internationally coordinated. The end result may even be a "Western Privilege Bloc" with a new Iron Curtain between us and the Third World. This is playing into the hands of those who are aiming for the New World Order, and those who support such policies are forging their own shackles, as well as everyone else's. What is remarkable about this email is that it confirms my suspicions, and this is the first example I’ve seen where somebody actually calls for a World Government under a single political leader to solve the problem that has been presented to them. I was once a nationalist myself, a Welsh nationalist. Thinking back I can see where I went wrong. Only by exposing this agenda and defeating it can we solve any real problems. Poverty in the Third World is itself manipulated; it is unnecessary and easily preventable and with the end of the NWO agenda will soon cease to exist. This means that people won't want to travel to live in the USA and Britain etc; they'll be happy to remain in their homelands. After all, when you think about it, who's going to come to England for the weather! Exactly, Ustane. Too often we are goaded into fixation on immediate difficulties and conflicts. We must keep our focus broad and ask ourselves every time: "How does this relates to the bigger picture?" It'll be worth it in the long run. Anon, it would indeed for us, but it would be a lose-lose situation for the New World Order agenda. It's no wonder that the things which make the most sense are never done, andywhere! Dennis, that's true. 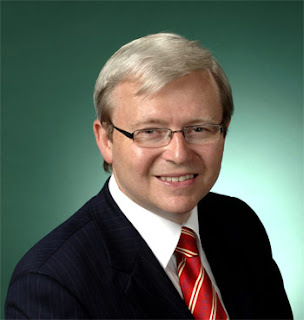 The support Rudd is getting from the public is typical of the way we're encouraged to focus on small-acale issues, and to see them as individual matters which are not connected to other issues. We rarely stand back and see the bigger picture. It saddens me that many people I know who understand about the New World Order still cannot see through this very obvious scam, and vote BNP etc. I'm about to put up a second article on this subject. See the page top.